Thanks everybody! It was a great tour. Thanks for having us @adamlambert ❤️ The tour was amazing! Last one tonight here in Munich #TheOriginalHighTour - I'm gonna miss ya. Thanks for an amazing ride guys. All Meet and Greet photos from The Original High and earlier tours. It was a marvellous spring day and I Prepared myself for the way to Munich to see - at least for myself - a quite different concert. ADAM LAMBERT did himself the honour of playing one of his only three appearances in Germany this night in Munich. Finally after 45 minutes it was time for the evening’s highlight: The lights in the Kesselhaus darkened and on the canvas behind the stage the gigantic letters A, D, A and M appeared, before Adam himself entered the stage. He was accompanied by a band and two dancers who supported him with their performance vigorously. The light show met all the wishes, just as the choreography - everything was thought out perfectly. His absolutely easy to remember voice came across always very expressional and the audience was sent into raptures from beginning. Beside his own hits he also successfully covered other songs, as for example 'Mad World' or also 'Let's Dance' from DAVID BOWIE. People keenly danced together, sang along and nodded their heads. Partially even disco feeling arose. ADAM used longer instrumental phases twice to change clothes and to lead the fans through the show in a new, unusual outfit. And every time again the audience in the sold-out hall was eager to follow his advices. In the middle of the concert he insisted on telling something and on thanking his fans. Finally, Munich was the end of his current tour. For this final show, his fan club has organised a nice poster action which impressed the singer obviously. Then after a nearly two hours the concert came to an end and the visitors, still in dancing mood, started happily their way home. 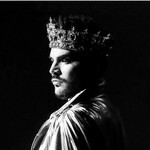 For my taste the whole presentation was a little bit too perfect: Not even the smallest detail was left to, nothing was changed spontaneously what I found a little sad, because Adam Lambert really has talent and could make more out of it! Anyway the audience has liked it all-over and this is the most important.